From an initial inception as a IIgs communications program called Impala, Spectrum™ was developed and released under the guidance of Dave Hecker of Seven Hills International. Originally released back in 1991, it was sold by Seven Hills until their eventual closure. 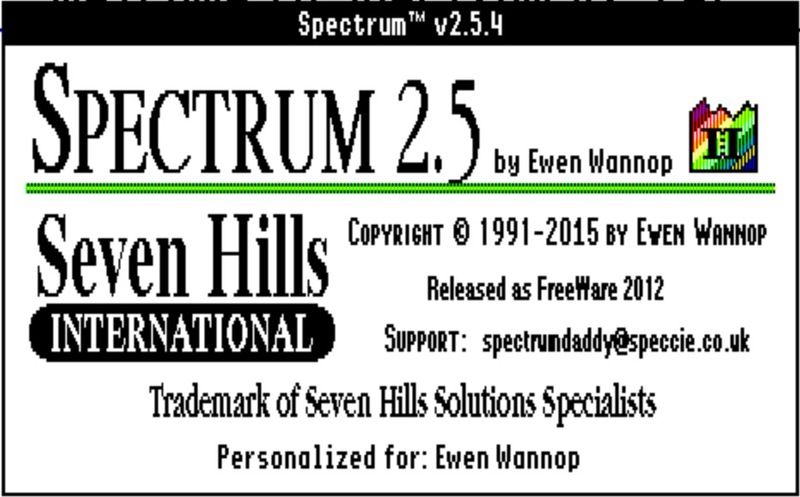 Spectrum™ is a telecommunications program written specifically for the Apple IIgs. It uses the standard Apple IIgs “desktop interface” so it’s powerful, yet easy to learn and use. The simplicity of the IIgs desktop interface, and the memory available in the IIgs, allows many features in Spectrum that are not practical in ordinary communications programs. A powerful scripting language allows Spectrum™ to be tailored specifically for individual use. Scripts can do almost anything you wish, ranging from emulating an electronic bulletin board, to the daily automatic logging, sending and retrieving of mail. It is also expandable with “plug in” XCMDs, which let you do many things that were previously thought impossible in a communications program. Spectrum includes many file transfer protocols, from X/Y/Zmodem through to the fast “Sliding Windows” Kermit, and is compatible with both serial connections using the serial port, and TCP/IP connections using Marinetti. Spectrum is an expandable program that allows access to many different “host” computers and systems. In addition to the standard Super Hires screen display, Spectrum™ can use an 80 column text screen display. Additional “drop in” displays are also provided (ANSI, ProTERM™ Special, Viewdata, VT100, etc.). Our goal was to make Spectrum™ a very useful tool so it would be a valuable tool for your personal use. Spectrum™ took me many years to complete. In fact, I originally bought my IIgs to write the program. I have had many steep learning curves during its development, and have changed my mind a number of times. Finally I got to the point where the program was a true, working reality. At the time, I was a full time lecturer in desktop publishing and computer graphics at an art college in England. I was also a Sysop of the TABBS Bulletin Board. The programming (in APW assembler) was done in any spare moments that I had left… hence the time it took to gestate Spectrum! When I set out to write Spectrum™, there were no communications programs such as America Online or CompuServe Information Manager to model it on, so Spectrum™ was conceived of as a conventional communications program. From the outset, I had ideas for some unique features, most of which have made it into the final version. Spectrum™ was my third major telecommunications program. My first two were very conventional: Data Highway (now Antelope), which runs under DOS 3.3, and Gazelle, which runs under ProDOS. Neither of these programs were ever sold openly in the US market, but were popular in Europe because both included Viewdata display drivers as well as the 80 column display. I hope you find Spectrum™ as useful and enjoyable as I have!